Build Volume: 10 x 8 x 8"
Built for professionals who require fast and precise prints with a high level of quality, the UP BOX+ 3D Printer from Tiertime is an upgraded version of the original UP BOX, with changes made to help meet customer needs. It features a build volume of 10 x 8 x 8"; a layer resolution of 100-400 microns; Fused Filament Fabrication (FFF) printing technology; uses ABS, ABS+, and PLA filaments; and is equipped with a single extruder nozzle that features a quick change mechanism and whose print head features improved heat management with a wider working temperature range. Users may print their compatible STL, UP3, and UPP files in an enclosed print chamber with a heated print bed via USB or Wi-Fi. Built-in light-pulse functional LEDs help users to monitor various system functions, while an integrated and replaceable HEPA filter system removes fine airborne particles and fumes. When compared to the UP BOX 3D Printer, the UP BOX+ supports filament capacities of 500-1000g, enables printing via Wi-Fi, has integrated filament run-out detection with UP Fila-detect, and can resume interrupted jobs using Active Resume. The UP BOX 3D+ Printer comes bundled with UP software and is able to use an integrated leveling probe to help ensure fully automatic platform leveling. The unit itself is built using a powder-coated metal frame with injection-molded enclosure panels, a vision panel, and a plastic case. It is compatible with Windows 10, 8, 7, Mac OS, iOS, and Android, and is powered using an included 110-240 VAC power adapter that runs at 50-60 Hz. The UP BOX+ comes with Wi-Fi support. Jobs can be printed from Windows, Mac, iOS, and Android devices. Tiertime has opened options for third party filament use. With UP Studio Software, users can now define profiles for specific filament types by setting both nozzle and build plate temperatures. Fine tuning for any filament is now possible. The UP BOX+ has now been updated to accommodate bigger filament reels up to 2.2 lb / 1.0kg. Sudden power loss due to cord issues or power outages can ruin a print, leading to hours of lost time and wasted filament. With the UP BOX+, this problem is no longer an issue. 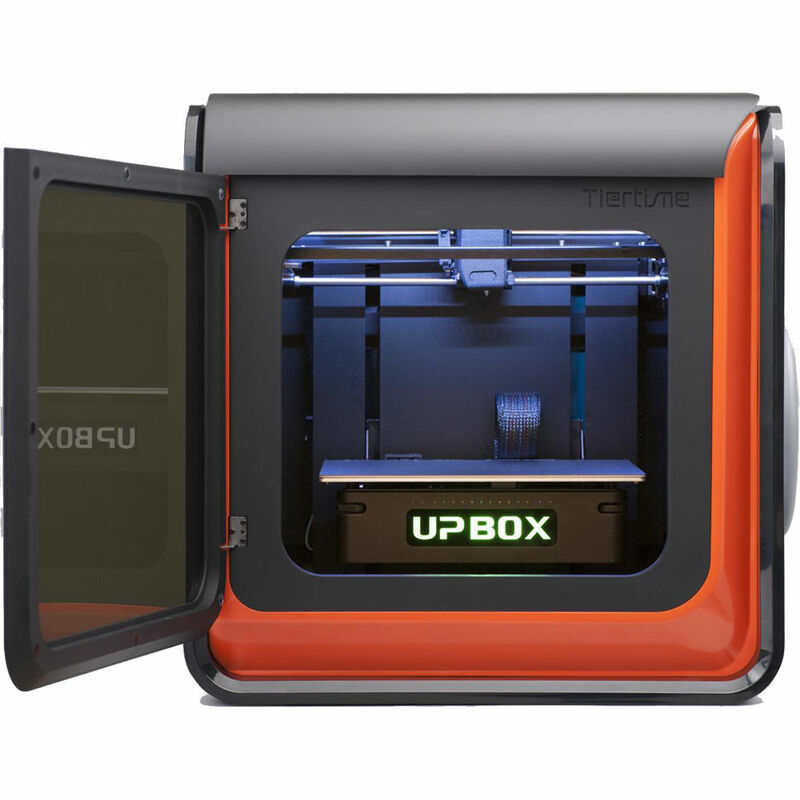 Once the power is back on, the UP BOX+ will ask the user if they want to resume the stopped print job, and finishes it seamlessly. Large print jobs are prone to running out of filament before the job is complete, especially when left unattended, or left to run overnight. With the UP BOX+, the print job will automatically pause if the filament is out. After the filament is reloaded, the print job can be resumed. Stabilizes build temperature to prevent warping (especially when using ABS filament) and improves both bed-adhesion and print-surface quality. Isolates users from undesirable effects of the 3D printing process, such as odor, heat, and danger-points. The enclosure design allows for "full-view" mode for viewing of process for management/maintenance and/or classroom instructional condition. "Full-view" includes front and "hatch" doors for top viewing and easy-access. Allows for remote and wireless operation and networked printer management. Untethered operation from a computer, laptop, tablet, or smartphone. "Grow-farm" management connectivity. Use multiple printers to create an integrated 3D printing network. Future connectivity for remote camera viewing across the Internet. Reduces and eliminates airborne particles and mitigates odors generated from the 3D printing process using Tiertime's UP CleanAir technology. Independent control of printer operations without the need for a host control device or computer. Control all aspects of 3D printing process on the printer itself including activation of stored print jobs queued up via wireless submission. 100 micron, high-speed, high-resolution output. Advanced & integrated preset temperature profiles for genuine UP Fila products. Variable temperature extruder control allows for custom control of head temperature for experimenting with most melted and-extruded-materials (MEM). An integrated spool holder/feeder stores neatly into body of printer. Full-auto run-out detection. A support algorithm automatically places support only where it is needed, then breaks away with ease, allowing even complex models to be printed. UP Studio software is a user-friendly, feature-rich, fast, and free. UP's auto nozzle detection works in conjunction with Tiertime's Level-Lok fixed calibration, resulting in low failure rates. UP Studio now supports Variable Temperature Control for both the extruder and the build platform, giving users enhanced control and more material options. Box Dimensions (LxWxH) 25.5 x 23.0 x 23.0"